Insurance is not included in the tour price. Credit cards are not accepted. Reservation one week in advance is requested. Tour guide Takashi confirms your application. To make a reservation, send an email to me with (1) your name (2) name of your country (3) number of participants (4) desired tour date (5) name of your hotel at Kanazawa or Toyama. September, October: Temperature is about 10 ℃ and lower. trekking shoes fitted for stony path. headgear. backpack. foldable rain gear. woolen long-sleeve shirt. bulky sweater, heavy trousers. windbreaker. gloves. snack and sweets. portable water. and others. 3:00PM 5℃. May the last 10days 9:00AM 6℃, 3:00PM 8℃. June the first 10 days 9:00AM 7℃, 3:00PM 9℃. June the middle 10days 9:00AM 9℃, 3:00PM 10℃. June the last 10days 9:00AM 11℃, 3:00PM 11℃. Transportation fare/person: Kanazawa - Toyama round \3,600 (purchase one day before). Toyama to Kurobe Dam Lake round trip: \13,190, a lunch and personal expenses are not included. Customers are requested to pay transportation fares and a lunch for tour guide, Takashi. Tour starts at 7:00AM. and ends 6:30 PM. We will meet at your hotel lobby in Kanazawa at 7:00a.m. Duration is 10 hours including lunch time. 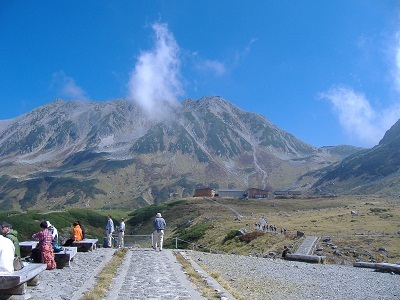 Mt.Tateyama is one of the three famous sacred mountains in Japan. 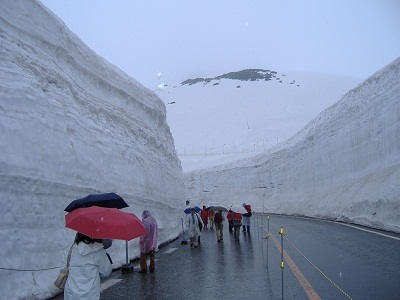 It is located the central area of Honshu Island,which belongs to Japan Northern Alps. This mountain ranges consist of several summits of about 3,000 meter-high. 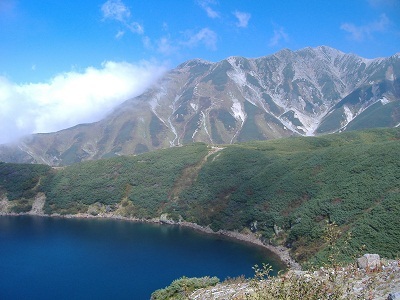 Murodo plateau is situated at an altitude of about 2,450 meters and is designated as the specially protected zone in the Chubu-Sangaku National Mountainous Park. More than one million annual visitors enjoy the wonderful natural environment and scenic beauties of the four seasons. Some regulations are taken to protect fragile ecosystem of high altitude. Visitords are requested to abide by them.